Wow, this thing is a game changer for so many aspects of my life. I’ve had the Anova Sous Vide Precision Cooker circulator for a little over a year, and I find myself using it a few times every single week. In that time and the hundred or so meals I’ve made, I’d say I’ve had just one food that wasn’t great. 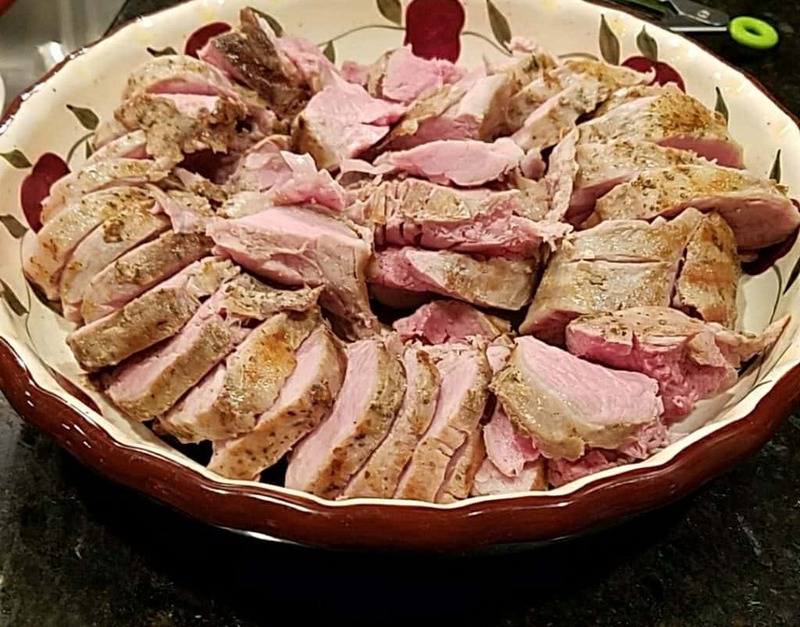 In simple terms, sous vide is a way of slow cooking food in their own juices to get your food of choice to the exact temperature you want and keeping it at that until you’re ready to eat it. So say you want to have a medium rare steak. The temperature of that would be about 130°F. Typically if you want to get a steak to that temperature, you’d have to cook the outside of the meat to a higher temperature to make the center of it that perfect tender pink 130 degrees. You also can’t guarantee that it will be that temperature in the middle anyways. The sous vide will keep the water at the 130°F the entire cooking process. Since the water is constantly moving around and the meat is sitting in the hot bath, still protected by the bag, it will slowly cook up to 130°F and not get a single degree higher. The entire steak will be that one temperature, also meaning no grey bands on the outside. We’ll use the Anova circulator to explain, but its basically the same process with other machines and kitchen tools that do this. The Anova Culinary Sous Vide Precision cooker looks like a long probe that you clamp onto the side of a big pot. You fill the pot with water, select the temperature you want for your food, then the Anova will heat the water and keep it moving until it reaches that temperature and it stays at that level. Now you take your food, usually a meat, then put that in a Ziploc bag or a vacuum sealed bag. Drop that bag in the water without any air in it. Set your timer and then come back any time after that timer is done and you have your food ready to go. Optional – sear your meats on a grill or cast iron skillet. Isn’t it just slow cooking? Well, yes and no. If you are thinking of a traditional slow cooker then that means that you’re cooking your food in a bath of a liquid that sits still in a pot. That liquid doesn’t stay at the same temperature the whole time and also isn’t moving around. The movement is a key part of the sous vide cooking. A slow cooker will always have a greater heat source at the bottom and sides of the pot that will create uneven cooking. Slow cooking on a grill or in an oven requires you to cook your food at a higher temperature than you need your food to be. This will make for a hotter/overcooked exterior that is also a dried out piece of meat since you’re cooking with air. You won’t have a bunch of pots and pans laying around from the sous vide cooking. You’ll just have a bag that you empty out and eat from. I can’t promise no cleanup from cooking your sides though. You know the exact temperature the food is going to be every time so the results will be the same every time. The only thing that will really change it is what you use to flavor your food and whether or not you let the food sit for much longer periods of time. Honestly, I haven’t been able to find better ways to make some of the foods that I’m easily cooking sous vide. Sous vide is super easy. It’s just a matter of finding a recipe and cooking it at the temperature the recipe calls for. I like to stockpile myself with some steaks or salmon that I vacuum seal and toss in my freezer. You can throw most foods straight from the freezer into sous vide for a convenient meal. You can buy a cheap cut of most meats and make them extremely tender using sous vide. Cheap cuts like chuck roasts can come out tender enough to cut with a fork and so flavorful. Salmon – I find myself cooking salmon much more often now because of the sous vide. You can get a perfectly cooked salmon every time in under an hour just by throwing it in the bag with some seasoning, olive oil, and lemon juice. Steak – This is supposedly what turns most people onto this device. You get a tender steak cooked to the exact temperature you want each and every time. Pork Chops – I hate cooking pork chops any other way because I get scared of under-cooking it and almost always end up leaving it on the heat too long and drying it out. Pork chops sous vide always come out super juicy and cooked to the perfect temperature. Tri Tip – I know I already said steak, but I’m talking more about the roast here. I like to season the roast at night, let it sit in the fridge then throw it in the sous vide before I leave for work in the morning. I get home later and have the most mouth watering meat ready that I can use for so many different recipes. I can also often find it cheap which means I get a lot of meals over the course of a week for just a few bucks. 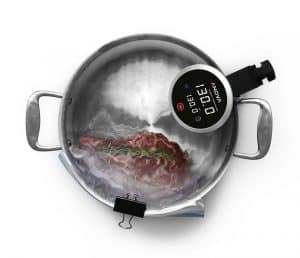 Anova Culinary Bluetooth Sous Vide Precision Cooker (Bluetooth) – I haven’t found a reason to spend the extra $50 on the wifi version. Rubbermaid Commercial Space Saving Food Storage Container, 12 Quart – I was using a big stock pot for a while, but then switched to this so I could just have a dedicated sous vide setup (see image at the end of the post) all the time. This giant container is cheap and lets me throw a lot of food in to cook when I’m looking to cook in bulk. 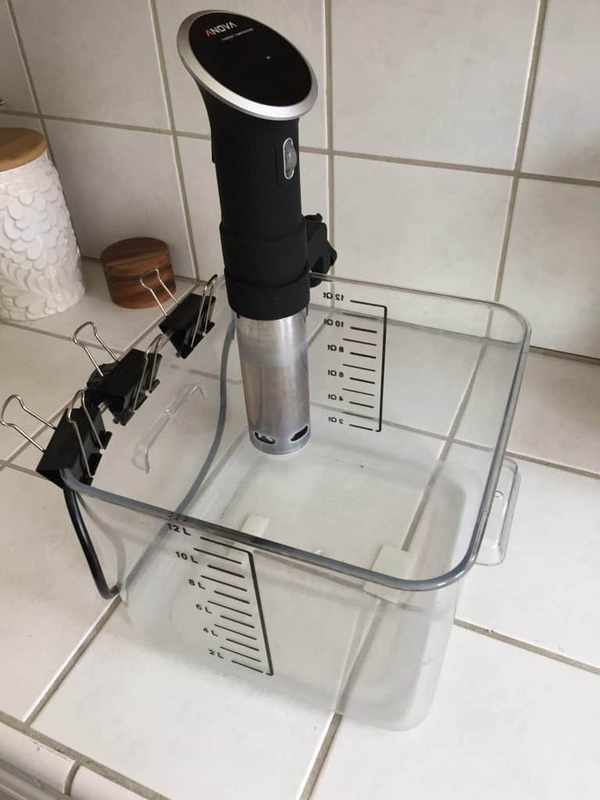 Sous Vide Lid for Quart Rubbermaid Containers – 100% optional, but I saw people using this on Reddit to keep the water from evaporating out of the container when you do super long cooks like 24 hour ribs. Lodge Cast Iron Skillet – I mean…this should be a staple in anyone’s kitchen. I’ll use this to get a nice sear on my steaks after I pull them out of the sous vide bags. Large Binder Clips – Another trick that I learned on Reddit. You can/should use these clips, or something else, to clip your bag to the side of your pot to keep it from dropping into the bath fully. You’ll really only need to do this if you’re using Zip-loc bags and you don’t want to worry about it falling in and water seeping into the seal. Zip loc bags – I highly recommend getting BPA free bags. I also recommend slider bags over the ones that you have to press. FoodSaver V3240 Vacuum Sealing System – another optional item. I really like having this so that I can keep foods in the freezer and have them ready to go for a quick sous vide cook. If you’re just going to go straight from the fridge to the cooking, then you can save some money and just use the regular bags. These aren’t my usual fancy photos that I like to take, but here are a few things I’ve made and shot with my iPhone. I actually didn’t make this to be perfectly honest. I came home from work one day and my roommate had this one going. The roommate isn’t the best cook, but this came out incredible. They were so juicy and insanely flavorful. I spiced this up with some salt and pepper, smoked paprika, and chili powder on a Monday night. Tuesday morning before work I dropped it in the sous vide setup at 130 degrees and came home to this wonderful piece of meat. Sometimes I’ll cook it with lime juice if I’m doing it for just a few hours to get some extra flavor into the steak. 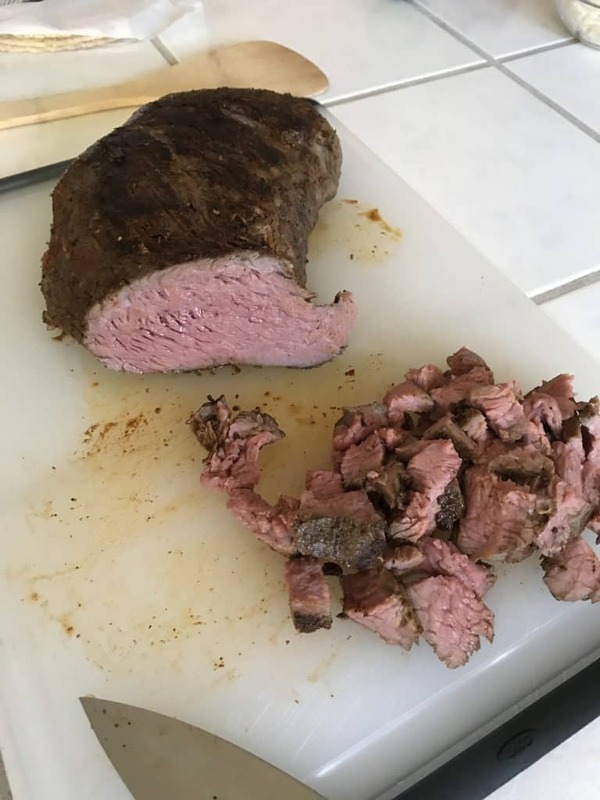 Yeah I know they aren’t paleo, but I made them with the above tri tip and they were amazing! 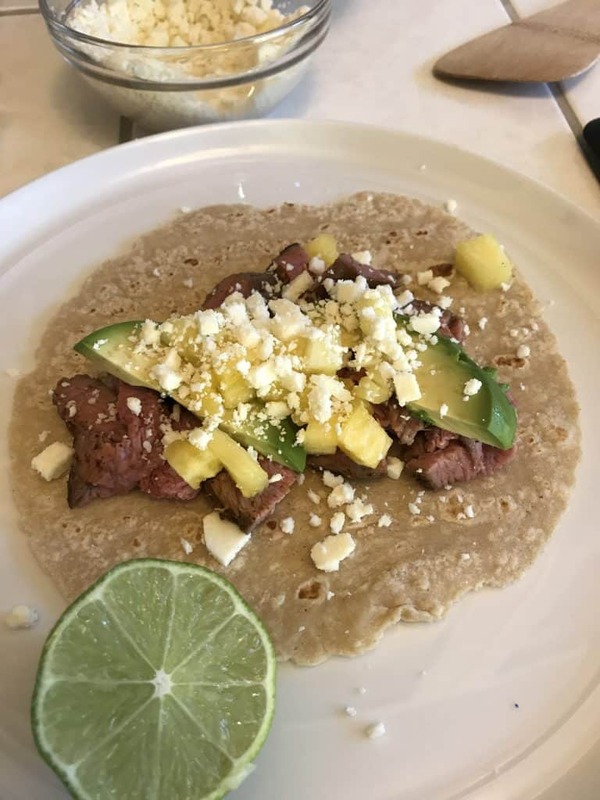 I chopped up a few tender slices of the tri tip then added cojita cheese, avocado, pineapple, and a bit of lime juice. OK, this is another one that I have to admit I didn’t make. 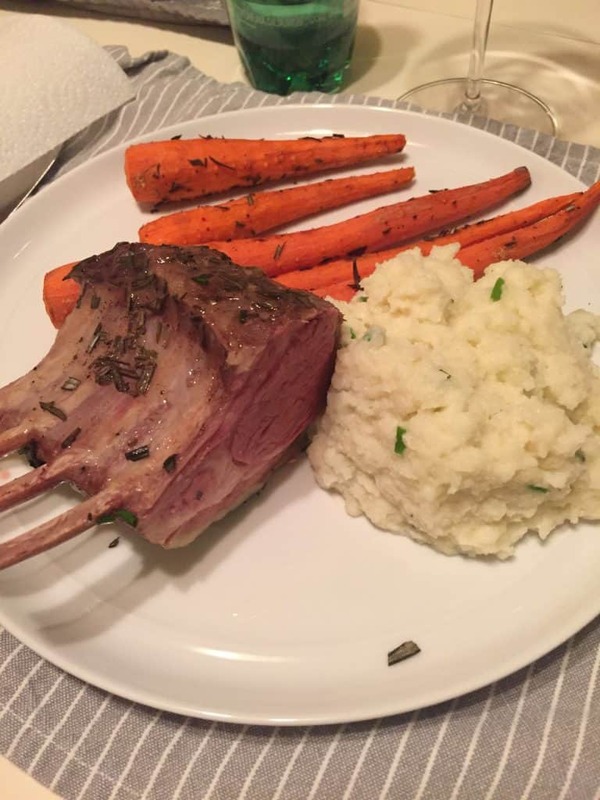 I bought my mother an Anova for her birthday this year and she’s been sending me photos every week of the things she’s been making. 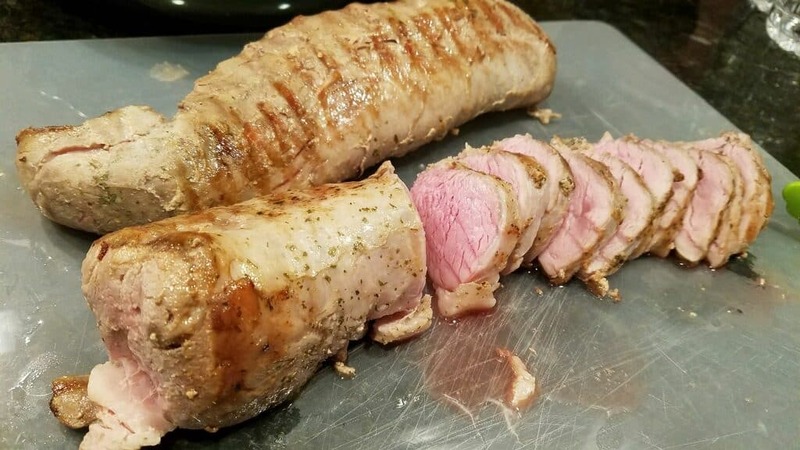 She was really proud of this pork tenderloin since she always complains that she can’t figure out how to cook pork that isn’t as dry as cardboard.